We participate in two different types of Geocaching at HikingUpward.com. The traditional Geocaching, where we place a small container with log book, pen, and small exchange item, and the Find A Free Hiking Stick Geocaching. 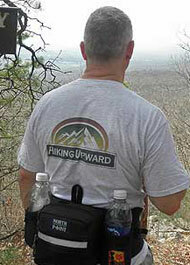 If you are the First-To-Find on one of our geocaches we have also included a HikingUpward t-shirt. These t-shirts are only placed in our geocaches or given away. So if you find one, take a pic and we'll add it to the 'Claimed' section of this page! On hikes where we have placed traditional geocaches you will see similar information to the left on the hike pages. Enter the information in your GPS..
Geocache information is also available at geocaching.com for most of our caches for use with applications such as the iPhone Geocache app. Over the years we have received many emails regarding the hiking sticks we use and were to get them. Hand crafted and personalized by a couple in Missouri they market them under the name "Wilderness Walker", you can purchase them on eBay. They will last a lifetime with proper care. To have some fun we are 'planting' brand new personalized 'Hiking Upward' sassafras sticks on some of our longer hikes. Find one and keep it for free! Here is an example of what a planted stick looks like. Note: Only the hikes with 'Find A Free Hiking Stick On This Hike!' log/lat information located on them still have, to the best of our knowledge, hiking sticks. Sometimes a hiking stick has already been found and the person forgot or hasn't been able to email us yet so we could remove the info from the page ... sorry we can't guarantee they're still there. Sorry, all the hiking sticks have currently been claimed. We will be putting some more out soon! Anyone can participate! Plot the hiking stick grid coordinates located on the hike page into your GPS. If you are using a map only and not a GPS make sure the map uses the WGS84 Datum. 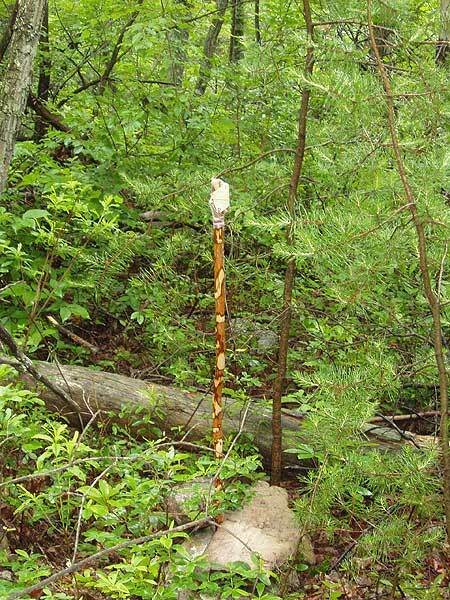 The hiking sticks are 'planted' in an upright position (example) no more than 100 yards off the hike trails. However, they are not visible from the trail itself, you need to be within 10-15 feet to be able to spot them. One per person please. If you've found and claimed one already please don't remove any others, we would like as many people as possible to be able to participate. It's obviously the honor system. 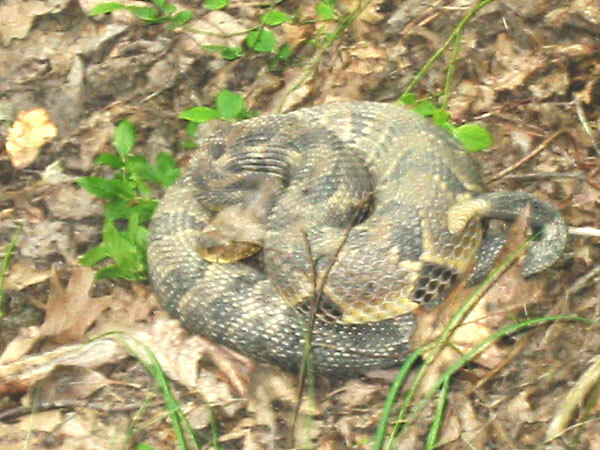 Note: Use caution when leaving the trail as Timber Rattlesnakes are hard to spot it the brush and if you are not comfortable leaving the trail and finding your way back please use common sense and don't participate. Take it, it's your to keep for free! Then please drop us an to let us know you located one so we can remove the hiking stick info from that hike. We will then plant another hiking stick somewhere else on the same hike. It's important that you let us know you found one so someone else isn't wandering around looking for a stick that has already been located. Also you can a photo of you and your new hiking stick and we'll post it on of FaceBook Fan page. If you are sure you entered the information into your GPS correctly and you were at the exact location most likely someone has already found that hiking stick and forgotten or hasn't been able to email us yet so we could remove the info ... sorry we can't guarantee they're still there. Also, please send us an so we can remove the information from the hike page until we confirm it's gone and plant a new one at a different location on the hike.